Scheduled for Sunday, October 7th, 2018 from 10 a.m. to 5:30 p.m.
Take a look at this great video recap courtesy of the Hoover Sun. Bringing in more than 1500 people annually, this community-based project partners Aldridge Gardens with scholars in anthropology, archaeology, history, horticulture, and ethnobotany, as well as leaders and representatives of the local Native American community. The purpose is to provide an accurate portrayal of the past and present of Alabama’s various tribes through engaging introductions to the traditions, art, cultural practices, and folkways of Southeastern Native Americans. Authentic Vendors Have Included: Food vendors sell general and Native American concessions (fry bread, roasted corn, and Native American tacos), and other vendors and artisans have pottery, shell carvings, gourd art, handmade flutes, woodburnings, jewelry, paintings, Southeastern tribal art, T-shirts and more. 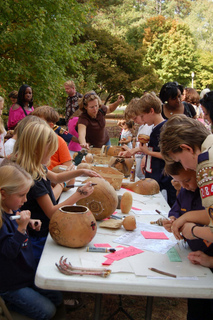 Hands-on Activities Have Included: Children were able to create pottery and gourd crafts, Cherokee leaf pounding, corn grinding, and bead weaving on looms. 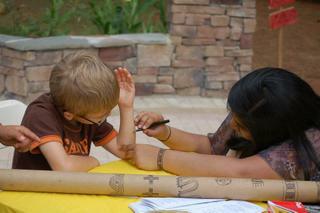 They were also able to play authentic Native American games and observe Native American dances. Whispers activities are aligned with standards from the Alabama Course of Study. 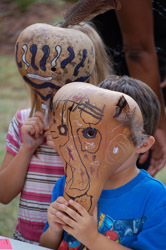 Children will demonstrate knowledge of prehistoric and historic American Indian cultures by participating in activities of early Native Americans. Student and child admission includes take-home crafts, while supplies last. In addition to our parking lot, offsite parking was also available at the Bed Bath & Beyond parking lot on Lorna Road. Hoover shuttles picked up (next to Lorna Road) and transported visitors to the Gardens. Our 2017 event sponsors included Alabama Tourism Department, Daniel Foundation, and Blue Cross Blue Shield of Alabama.